If you are significantly overweight, you may be at risk for a wide variety of health issues, including diabetes, heart disease, sleep apnea, breathing problems and depression---and you are not alone. The Bridges Center for Surgical Weight Management at St. Luke's Medical Center is here to help. The Bridges Center is proud to be Voted #1 in the category of Surgical Weight Loss Management for 3 consecutive years in Ranking Arizona Magazine. The Bridges Center for Surgical Weight Management at St. Luke's Medical Center is multidisciplinary weight management program that features preoperative education, weight loss surgery, nutritional education and guidance and postoperative support---all designed to help you achieve and maintain your weight loss goals. Ready to get started? Take the first step in your weight loss journey by signing up for a seminar or participating in our webinar. The Bridges Center is on Facebook! Connecting with the Bridges Center on social media gives patients and potential patients the opportunity to learn more about the journey of weight loss surgery, hear from other patients who have gone through the process and to share milestones of their own within our close-knit community. Followers also get-to-know the team members at the Bridges Center and are able to ask questions pertinent to them. Why Choose The Bridges Center? Our weight loss surgeons are board-certified in bariatric surgery and leaders in their field. 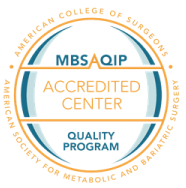 St. Luke's Medical Center has been designated as a Metabolic and Bariatric Surgery Accreditation and Quality Improvement Program (MBSAQIP) center (formerly known as a "Center of Excellence") by the American College of Surgeons and Society of Metabolic and Bariatric Surgery since 2006. In addition, we are proud to have numerous quality accreditations that set us apart from other surgical weight loss programs in the Valley. The Bridges Center has a proven track record of more than 900 surgeries a year. Should I Consider Weight Loss Surgery? Hearing from others and gaining the support of people going through the same process as you can be a powerful thing. Classes are held at the Bridges Education Room, Suite 105 and are free of charge. For a complete class schedule listing or to register for an upcoming class or support group, please contact your patient advocate or Bridges Center at 602-251-8828. Assigned patient advocates to walk patients through the insurance process and various consultations needed pre and post-surgery. Registered dietitians to provide patients with nutritional guidance throughout their journey. Bariatric trained registered nurses to provided specialized care for patients during surgery. Psychologists to assist patients with the psychological support needed throughout the journey. New to Bridges, a Family Medicine Physician Board Certified by the American Board of Obesity Medicine, also known as a Bariatrician, to assist with the management of obesity health.